Guaranteed for high quality, guaranteed for lowest price! If you find a better price of similar product on the market, we will not only match that price but also reward you with a nice bonus! Portable and very powerful, STUF-300H is ideal for HVAC, meter verification, flow surveys and other closed-pipe applications. Compact and easy-to use, you can hold and operate this unit with one hand. Clamp-on fixture design makes installation very simple and no special skills or tools are required. Ideal for flow measurement at fixed locations, transit-time-based STUF-300FxB flowmeter offers outstanding capabilities for accurate liquid flow measurement from outside of a pipe. NIST-standard performance. 1% accuracy. Widely used in water resource management, chemical processing, hygienic liquid processing, high-pressure flow, and other applications where non-intrusive is a must. GSM/GPRS wireless model available. Designed for installation at a fixed location for long-term flow measurement without maintenance, the STUF-300FxC’s insertion transducer provides strong signal strength and exceptional signal quality. Accuracy as high as 0.5% when in-situ calibration is available. Hoptapping installation without shutting down flow. High accuracy, plug & play, excellent long-term stability and zero maintenance are the hallmarks of this innovative flowmeter. Parameters have been pre-programmed in the factory, so simply place the flow-cell into the pipe line and the flowmeter will be up and running right away. Low-cost, yet high performance, STUF-300Ex employs leading-edge technologies on ultrasonic transit-time measurement, digital signal processing (DSP) and low-power electronics. Ideal for large quantity, low cost applications such as flowmeter networking, water distribution and solarpowered flow monitoring. For flow measurement applications in rural area where electrical power is not accessible, our ST302x provides an ideal solution. It has a solar panel, a battery, and a low-power consumption high-performance ultrasonic flowmeter. All the components, except transducers, are housed in a weather - proof robust enclosure. An excellent meter for highly accurate thermal energy measurement of a liquid-based thermal energy production / transferring system. Non - intrusive design means there is no pipe cutting, no moving parts, no pressure drop, no leaks and no risk of contamination. STUF-300R1B is a perfect tool for improving HVAC/building energy efficiency, energy production and transfer and for monitoring geothermal or solar-thermal systems. Next-generation BTU meter, designed for both residential and commercial applications, utilizes the latest technology in ultrasonic flow measurement. STUF-280T has no moving parts so it’s wear-free and stable over time. With a life span typically 15 years, STUF-280T features an automatic meter reading (AMR) system, allowing you to easily manage building resources. 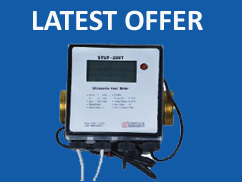 The most advanced ultrasonic flow measurement technology available, STUF-280W is a cost effective water measurement solution for a wide range of commercial and residential applications. A high measurement dynamic and no moving part in the sensor offer wear-free water measurement, precision, stable operating security and long service life. This magnetic flowmeter is designed for liquid application where high-accuracy is needed. It has been widely used to measure the volume of conductive liquids, such as water, sewage (including raw sewage), slug, salt water, acid, alkali, etc. 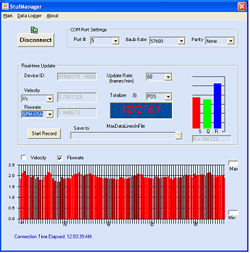 StufManagerTM PC software makes it very easy to connect a Shenitech ultrasonic flowmeter to a PC through the RS-232 or RS485 link. The software automatically detects the COM port used by the PC and talks to the flowmeter with minimum human interaction. 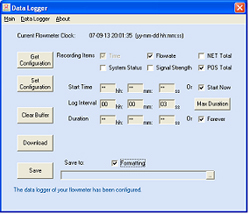 The PC software obtains real-time data from flowmeter and displays the data on a graphic interface. It also provides an easy to download data from the data logger of the STUF-200H handheld flowmeter. It converts the data into standard format which can be imported into Excel for further data manipulation. Ultrasonic flowmeters are very promising instruments for pipe flow measurement in process control, flow survey, custody transfer, etc. They have many advantages over conventional flowmeters, such as non-intrusiveness, no pressure drop, no moving parts, easy installation and minimum maintenance, just to name a few. Depending on the measurement technology and transducer type, ultrasonic flowmeters come in several different types, such as clamp-on, handheld, insertion-wetted, flow-cell/spool-piece type, wall-mount/fixed-installation flowmeter, etc. Please click here to learn how to select a ultrasonic flowmeter which best suits your applications. Feel free to contact us if you have any questions. We are more than happy to help you select the right product. A typical transit-time ultrasonic flow meter system utilizes two transducers that function as both ultrasonic transmitter and receiver. The flow meter operates by alternately transmitting and receiving a burst of sound energy between the two transducers and measuring the transit time that it takes for sound to travel between the two transducers. The difference in the transit time measured is directly and exactly related to the velocity of the liquid in the pipe. For detailed explanations, please click here.